CARPE DIEM: Jobless Rate in Williams County ND Is Below 1%!! 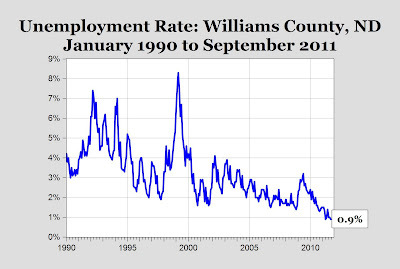 Jobless Rate in Williams County ND Is Below 1%!! Williston (ND) Herald -- The latest numbers from Job Service North Dakota’s Labor Market Information Center report that Williams County has the lowest unemployment rate in the state, and perhaps the lowest in the entire United States. 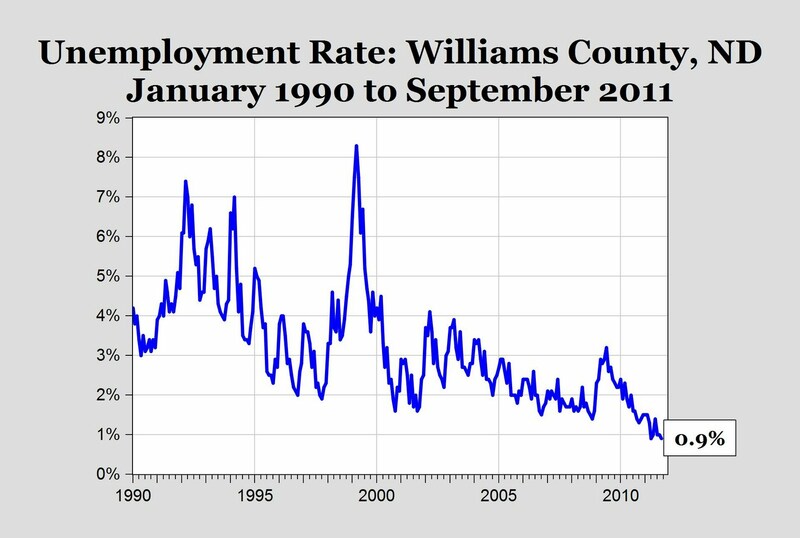 September numbers, which are the most recent available, put Williams County at a staggeringly-low 0.9 percent (see chart above). Related: North Dakota had 17,545 open and available positions in September 2011. Note: Williston, North Dakota is at the center of the energy-boom Bakken region of North Dakota. If the country had a real economic recovery, from less regulation, more tax cuts, and less government spending, the energy industry would've help fuel a virtuous cycle of consumption-employment, and reduced budget deficits, because oil prices would be higher, until enough supply is on-line. The low unemployment rate suggests wage or compensation increases more than offset any cost of living increases. What do you bet that the unions won't bus any unemployed out to Williams county? Williams country has a population of...22,000. Thats about half the student population of the University of Michigan. Lets keep things in perspective. All the pikes in that chart tell me that what we are dealing with is a workforce which probably engages in a lot of "fluid" jobs; farming, trucking, mining etc. The dynamics of such an economy are pretty different from other areas of the country. "All the pikes in that chart tell me that what we are dealing with is a workforce which probably engages in a lot of "fluid" jobs; farming, trucking, mining etc. The dynamics of such an economy are pretty different from other areas of the country." Well, you may be right about all the pikes in that chart. But the improvement in the unemployment rate is what the rest of us are are talking about -- and marveling at. Different or not, the rest of the country might envy it and be better off for having a few of those "fluid" jobs. Those "fluid" jobs will, before long, result in a not inconsiderable number of "non-fluid" jobs, I suspect. Well ok, but it represents an example with some unique circumstances. All it tells us is that, a tiny community which discovers oil or gas or other natural resources in its ground, will gain from it. Nothing new here. America's economy be definition is highly diverse, far more diverse than North Dakota's, or Wyoming's, or West Virgina's etc. Their growth is great, but one should be careful to compare it with other entities which have very different circumstances. AIG, the chart shows stable employment, with little frictional unemployment, over the past 10 years, because the unemployment rate has been below 4%. Also, there's a "spillover effect," which benefits the entire economy. When employment and wages rise in a region, consumption rises, and the higher level of consumption won't be limited to the region. PFCT says: "Send the moronic occupy protesters to Williams!" "Thousands of protesters opposed to a new oil pipeline from Canada to the United States circled the White House complex on Sunday to press President Barack Obama to reject the project on environmental grounds." Peak, I'm not denying anything you said there. Though I'm not sure how you don't see frictional unemployment in that chart, given what appears to be a lot of seasonal effects going on there. But thats not very relevant, anyway. My only comment was that what is going on in North Dakota isn't anything surprising, at all. Also, I'm sure, there's some overtime involved to adjust for seasonality, particularly with such a low unemployment rate. Seasonality in oil work is common. In Canada, and in ND, government road travel restrictions during the spring thaw causes a slow down in drilling. In Canada, at one time, about 1/2 of the yearly activity occured in 1/4 of the year (winter). It has come down some, due to construction of all season roads, but we still see rig count going from 600+ in mid winter, to 120-200 in spring. Could be the lowest in the world? Check out the housing market in Williston. Only 50 listings on Realtor.com - at any price. Where else could you ask almost a quarter million for a mobile home on 3/4 an acre? Could be the lowest in the world?" Nope, Andora and Monaco both have Unemployment rates of 0.0%, and Qatar, 0.06%. As AIG pointed out, the population of Williams county in ND is 22,000. If you look at small enough sample, you can find whatever statistic you like. Eric H.: "Where else could you ask almost a quarter million for a mobile home on 3/4 an acre?" I wonder what the buyer will think of his high priced mansion when the excitement dies down and prices return to previous levels? Check out the two available listings for land (1/2 acre or greater)in Williston. Given the fact that shale producers are chewing through capital I doubt that you can argue that the malinvestment will fuel a sustainable recovery. How do you know that the employment is stable? The shale companies have been chewing through capital and cannot generate enough cash flow to finance ongoing operations. With shortages all along the supply chain the services sector is getting very expensive and is creating a negative headwind for the producers. Add parasitic governments and the usual troublemakers and the industry is going to have problems that will be very difficult to overcome with such a low return on the energy invested. Everyday Currency Manipulation in the U.S.?